Whatever happens is likely to be different than what’s expected, or a mix of everything expected. Solar storm in 2012? NASA says no. –Under the category of hype, NASA supposedly warned to expect major solar events in 2012, launching breathless reports of solar storms and pole shifts, but the assertions have been refuted as the opinion of one scientist trying to sell his idea. Lesson learned: don’t believe till there’s verification. –All too real though is the possibility of crossing over an environmental “tipping point” triggering an apocalypse driven by hunger and desperation. The major wheat-producing regions of the world have been hardest hit by climate change, alternating between epic droughts and torrential floods; the polar ice caps are melting faster with each passing season, eventually leading to dramatic sea level rise around the globe; earthquakes are increasing in frequency and intensity, and as the world saw in Japan, nuclear catastrophe is only a few shakes away. –World war is looking more likely with every missile launched and bomb dropped. Dominoes are falling: Tunisia, Egypt, Libya. Unrest is spreading to Syria, Yemen, Bahrain and other countries like Saudi Arabia and China that have so far repressed public demonstrations. Pakistan could be next, and that possibility most certainly would be disastrous for everyone because Pakistan has been pumping out nukes and a large segment of the population is radicalized. Even without a world war there are enough conflicts already raging that could turn apocalyptic. Libya for one has a stockpile of mustard gas and who knows what else, and the old regime swore to go down fighting. Gadhaffi vows a long war in Libya. Ruling out a solar apocalypse in 2012, there are environmental and warfare scenarios coming to a head, and we still haven’t considered the threat of a terrorist event bigger than September 11, 2001. Bin Laden is most likely long-dead, but his war lives on, and a new generation of terrorists have taken up the cause. With chaos already spreading, they are likely waiting to deliver a knockout blow at the moment when Goliath is most vulnerable. It’s been part of their strategy from the beginning. The greatest possibility of that happening is with a devastating cyber attack. Very smart people at computer terminals around the world are, this moment, thinking about how to infiltrate or bring down systems. Our entire infrastructure is based on network computing, and as Iran learned the hard way, saboteurs get around almost any obstacle. Hackers could crash a stock market or a banking, energy, transportation or communication system — a large number of potential targets. The threat is greater than most people realize, and no Internet kill-switch is going stop the damage before it’s done. Even without an Armageddon the situation looks pretty bleak, and these are the conditions predicted to precede the Second Coming of religious figures from traditions around the world: the Christian Jesus, the Muslim Mahdi, the Hindu Kalki, the Buddhist Maitreya (Great Teacher) — expected by their followers to return at a time of unprecedented chaos, warfare and exploitation. That sure sounds like what is happening presently. Jesus said it would be a time of “wars and rumors of wars,” increased earthquakes, signs in the sky, fear, famine, division. Edgar Cayce, a prophet of the modern era, also foresaw tremendous changes coming like the kind expected at the end of 2012: coastlines dramatically altered, major cities under water, entire populations shifted inland. The conditions currently exist that could make these prophecies come true, but it’s not God and the Four Horsemen delivering the punishment; it’s the result of our own actions — or inaction in the face of overwhelming proof that humans have made the planet and each other sick. The universe balances everything, and humanity is badly imbalanced, making a major correction inevitable: apocalypse. It might happen to coincide with Mayan predictions about 2012, a time cycle that has already begun and was predicted to be chaotic, ending with a great deluge. 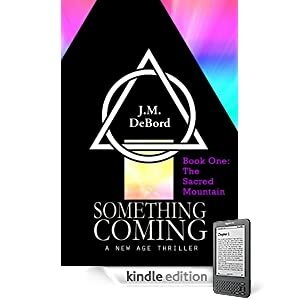 Read the author's novel, which explores Second Coming prophecy and apocalypse. Available for Kindle @Amazon. If Cayce, Jesus and the other prophets are correct, some sort of Final Battle is also coming, though not inevitable. By studying prophecy I’ve learned that the future is a broad outline of a story driven by forces beyond the control of the characters: us, humanity living in the present day. But the details are certainly within control, and prophets forewarn in part to provide the information needed to dodge the bullet. So while the Mayans foresaw Earth under water, and Jesus predicted unprecedented disasters and wars, and Cayce warned of dramatic climate change, we still have the power to prepare for the future, to carry on, to correct ourselves by learning to live in harmony with the planet and each other. It is within our capability. When things get bad enough, people adapt. Let’s hope it happens before too late.